There used to be a time where I would know that there was a food holiday like World Bread Day. 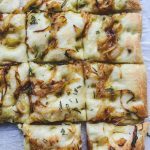 I would have made this Vegan Caramelized Onion Focaccia or even something a little more fancy to share with all of you. I used to be so passionate about sharing a different bread here every month. I even hosted a monthly bread baking event called #TwelveLoaves. It was always so much fun to get together online and talk about the next theme and then the anticipation of waiting to see what everyone baked. My kids were also super excited to see what we would be baking and were waiting for mommy to get in the kitchen and make something different and delicious. Did you know that October 16 was World Bread Day? I’m so out of touch with blogging events and I didn’t realize that it was coming up. 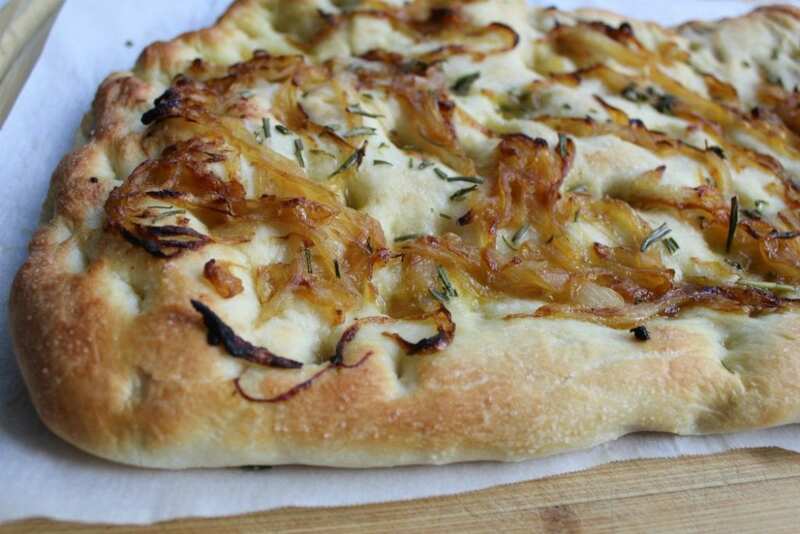 It just so happened I had baked this gorgeous Rosemary and Caramelized Onion Focaccia just because. Just because it is the best bread combo ever!I also shared this focaccia before with cheese. 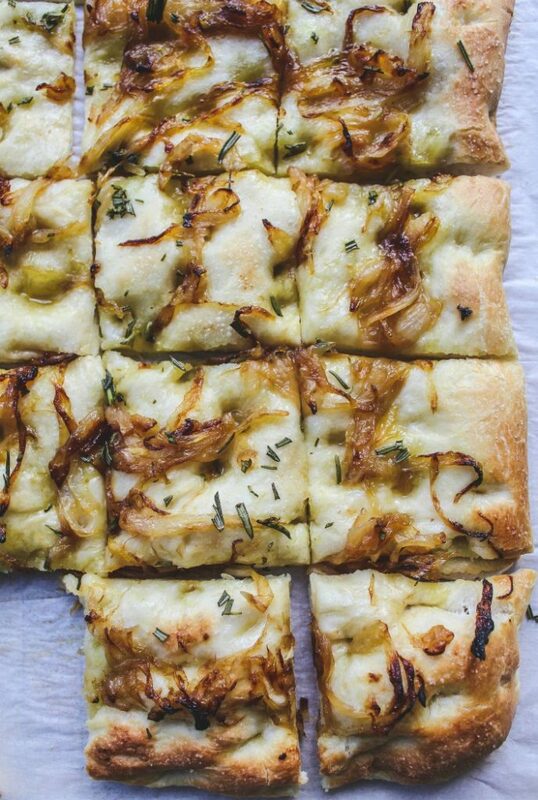 Gooey melted mozzarella on top of the caramelized onions takes this bread to a whole different level. If you are into gooey melted mozzarella cheese, take a glance at that recipe. That could be considered the 2nd best bread combo ever!! Or maybe they could both tie for 1st place. Here is another version of focaccia made with raisins. Yes, raisins! It is a delicious sweet focaccia with a crunchy sugary topping. OUT. OF. THIS. WORLD!! One more savory option that is also vegan, Sweet Potato and Leek Focaccia is fantastic! But one more thing about this particular bread. It is totally VEGAN! Yes, all vegan, every bite. I have so many friends that are newly vegan or dabbling in veganism. You may have a time in life where your vegan friends are coming over for dinner and you want to make them something impressive. THIS is what you will make them. 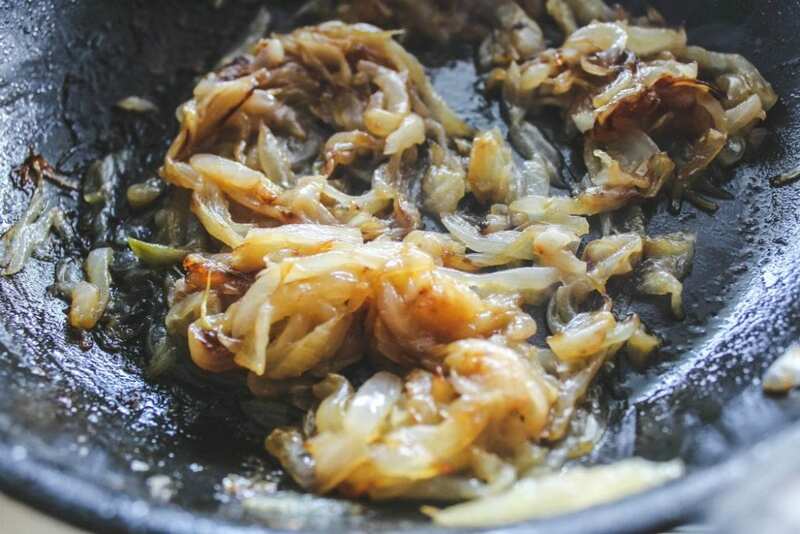 THIS bread and any veggie side dish is all you need to really WOW them. Can you tell I’m still excited about this bread??? So just for a little irony with this whole World Bread Day holiday and my personal life. This weekend I was enjoying a salt bagel from my favorite local bagel shop. We were visiting our sweet friends that just had their 4th child. As I was oohing and aaahing over the mom feeding the baby, I bit into my bagel and something happened to one of my teeth. Well, that something ended up being extremely painful as the weekend progressed and I ended up going on Monday to have an emergency root canal! Yikes! That is my fun bread story to share with all of you. I can guarantee that this is a bread that will not cause any tooth fractures. It is soft and it is fluffy. It is a bread that you will want to bake over and over again! For what is life without good bread? I promise that Julia would be proud. This does not taste like Kleenex!! What’s the best focaccia baking tips? If you really want to make this focaccia and time is not in your favor, you could make the dough and leave it in the refrigerator over night. Or you could make it in the morning and put it in the refrigerator until the end of the day when you are ready to bake it. When you are ready to bake the bread, remove the dough from the fridge and press it into your oiled pan. You have to let it rise before baking it. The most important tip is to let it do it’s 2nd rise in the pan you will bake it in. My kids love the square pieces, so I usually bake it in the baking sheet. I sometimes bake it in a round pan. Either way, you can’t go wrong. The last tip I can give you I touch on in the first tip, make SURE you brush the pan or the parchment paper with olive oil. And when the bread is finished, brush on a another layer of olive oil. Trust me, all of this olive oil makes for the most delectable bread! I mention in the recipe title that this focaccia is vegan. Many Italian restaurants are vegan. So it really would not normally be described as vegan as you’re traveling around Italy. But I wanted to point out that it is vegan for my vegan readers and friends that want to make a completely outrageous Italian bread and not worry if it has eggs or any sort of dairy. Now if you want to make this not vegan, go ahead and melt some cheese on top! (you could also use a non dairy cheese!!). A simple to make homemade focaccia recipe that is vegan. 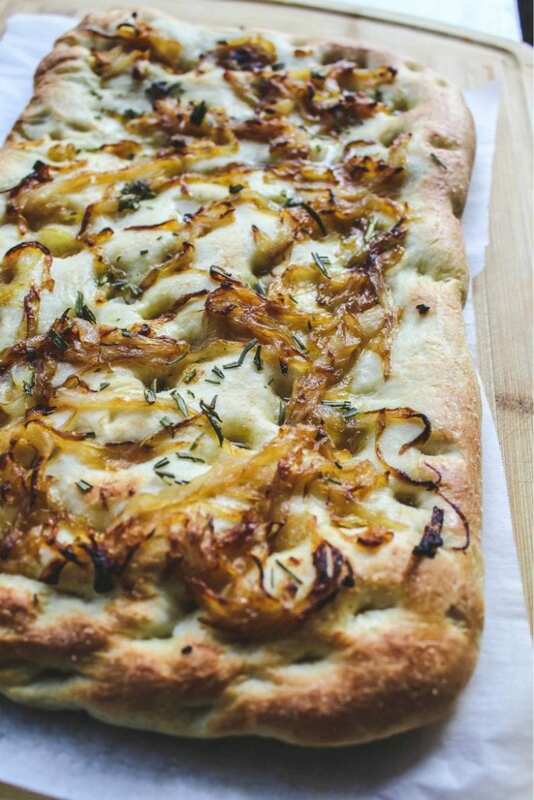 The caramelized onion and focaccia topping make this bread beyond delicious. The bread is so delicious you could eat it as a meal with your favorite salad. Place the dough on a parchment lined baking sheet. Pat and press the dough gently until the dough fills the pan completely. If the dough resists, let it rest for a few minutes before continuing (sometimes the dough can be moody). Cover the dough with a piece of plastic wrap and let it rise again until doubled in size (about 40-60 minutes). Bake for 25-30 minutes, or until golden brown and puffed around the edges. Remove from oven. Lift the focaccia from the pan with the parchment paper edges onto a cutting board. You’re supposed to let it cool a little on a rack before serving. That never happens over here. Brush on a little olive oil (the last tablespoon from the 4 tablespoons in the ingredient list) on the hot focaccia. Cut and serve. Love your combination of flavours ! Thank you ! How big is the pan you used? I can’t seem to find that! Thanks! You could use a baking or a cookie sheet.